The following is the 15th message that we received in Avalon (England and Scotland)this past June/July 2012 over Solstice. You can find our other messages on our website at www.alunajoy.com under the "Articles for Personal and Planetary Transformation" link. It might be a good idea to read them in order as each message builds upon the previous one. We are sharing this message here with you just as we received it, in present time, with very little editing. We do this for a very important reason. We know that the messages that we receive are not just for our groups, but are for others as well. The Star Elders and all the others that joined us, assure me that the message and the corresponding energy will be transmitted to you as you read them. So as you read this, you might want to imagine that you are with us. Also, always view the photos on the website that we share, as photos also hold some energy of the sites. Aluna begins sharing the message. . . .When the Star Elders lived on the Earth, they anchored a quality of spirit that was magical, or mystical. It was a presence of nature-a presence of the wholeness of nature-that they carried inside of them when they were on Earth. They say that we will carry it inside of us as well. This will be more apparent as we get closer to wherever we are heading to on this path we are on. The Star Elders always saw this quality of spirit that we can feel in the air. Clues to the presence of this spirit might be that the birds sing extra sweetly, the grass is really green, and the air is sweeter. It is a presence of spirit much like what we felt in Tintagel. But this place feels very grounded and real, yet there is a sweetness and a feeling of abundance where nature really comes alive. The Star Elders are showing me that this is the way it was in other parts of the world when the Earth was anchored with this magical energy all over the grids. They also say that this energy will again re-enter and flood the Earth with the magical energy we feel right now. There is definitely the presence of a lot of women here, a lot of women who knew they were holding this energy. (Months later Karin from our group uncovered their names-the Guardians of Grace.) These women allowed themselves to be imprisoned because they knew they were going to come here to this sacred land. This island is on a grid line, and they knew they had to anchor their magic and wisdom here. Contrary to history and outer appearances, none of the women were imprisoned on this island against their will. I was expecting to feel resistance here, yet we are not. Mary Queen of Scots and other women allowed themselves to be brought here because they had been negatively labeled, as a lot of us have been labeled for living "outside the box." They allowed themselves to be brought here because they knew that together they could anchor their special energy and wisdom, a quality of spirit, in a pure state without any outside influences or interruptions. In fact the guardsmen of the prison knew this as well and were the women's protectors-most likely they were knights pretending to be prison guards. 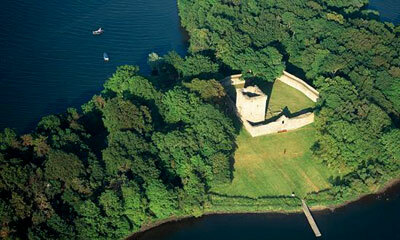 The castle is completely surrounded by water, so it is very well protected psychically. We noticed that the island definitely has a cocoon feel to it. Off the island, we can't feel much, and it is almost as if the island is not here at all, like it is invisible. That cocooning effect is probably a natural occurrence that was enhanced by the power and grace of the women. The women used this earth grid to anchor even deeper the energy that the Star Elders call pure potential of the creative force in nature. This place has many acupressure points, similar to what we have been learning about and discovering at different sacred sites. Also, this place has been used for a long, long, time. It is very, very ancient, much older than any recorded history. I definitely feel that there is something else locked here deep below. All we can read about today is recent history. It is fascinating to me that there is a break in history in every lineage all across the world. Because of this break in recorded history (called pre-history) there are a lot of assumptions and myths regarding pre-history. Much of pre-history evolves into myth. Consequently, we know that all myth always has some foundation in fact. But myth gets romanticized, and the truth becomes exaggerated. Yet those of us with open hearts and eyes to see can uncover the truth within the myth and bring it back to life. This is what we are doing in these intense transformational times. We are re-birthing the light and truth of authentic power upon the Earth and within our bodies. I feel the energy of a lot of women, the Guardians of Grace. Because of the area's natural and energetic safety, these women were able to stay very open, as they were incredibly protected. It reminds me about when I fell at Tintagel and cracked a rib over my heart. I said how open I felt and how much I felt. I couldn't say anything without crying, and everything I shared came out so deeply emotional. I was picking up on energy that was beyond anything I have ever felt before. I think the women who came here were able to stay in this state of wide openness for a long period of time because they were so protected here. They could anchor this same loving wide open energy. The protection on this sacred land allowed them to open to a level of grace and love that could heal the planet. It feels like their hearts are anchored here very deeply and unshakably. Now we get to remember this energy and rebirth it once again. I don't feel any tragedy here. The women knew what they were doing. They played the role of prisoner on the outside to appease the fearful. They said, "Okay, you win. You can imprison me here if you think I am a witch." Although the word "witch" has negative connotations, they knew they were Goddesses, the Guardians of Grace. The Goddess women knew that when they came here gossip would die down, and they would be slowly forgotten. There is no better psychic protection then to be forgotten by your enemies. For the fearful community on the mainland, they were out of sight, out of mind, so they were no longer psychically connected to anyone on the mainland. For example, if someone thinks about you, it opens a psychic door between you and that person. If someone says, "You look tired today. You must not be feeling so good," don't you always feel a little worse? This is a light form of psychic attack. On the other hand, if someone says, "You look really great today. You are glowing," don't you feel better? These are all projections. The women who were sent here needed to go to a place where they could be clear of other people's negative projections. They wanted to be out of sight, out of mind, so they could do their work. Now we have been talking a lot about the Michael and Mary lines and walking/working with the acupuncture points on the Earth. Up here in Scotland, we are entering the Rose Line. The Rose Line has to do with the ability to BE wide open with our hearts-to have love without armor, or barriers. We have so many ways we shut ourselves down in what at times can seem a brutal world. We need to learn to unchain our souls and our light. It is time for a re-birth. The steps we are taking now are our first much needed steps that go beyond that which we have previously known. We are moving into a place that is opening us to that which is beyond our old, fading reality. We are entering a space beyond any place that we have gone before in any life; we are moving past the past. All the mystics and seers of the world are talking about the new energy we are moving into. The Star Elders didn't give us the integration time because they knew that out of habit, we would back up, and we would armor ourselves again. They want to take us an extra couple of steps beyond our known universe, so to speak. So, it looks like what we are doing is actually stepping beyond what is known and comfortable into something that is going to expand us out even further. (and those reading this). The new energy we are feeling is anchored in nature and the core of the land here. When I feel this energy, it is hard to describe-except through feeling-we notice the way the air feels lighter, the way the grass moves, and the way the birds are singing. So remember this feeling. You will find it in other places, and that same feeling will be a clue that it is another grid point in which to anchor you heart and grace. 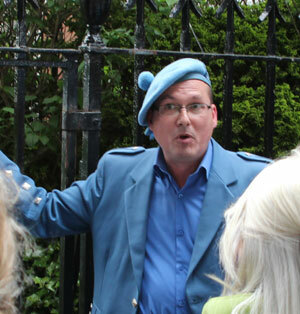 Our local Scottish guide Iain: That exactly explains my mysticism. It is based on an experience of growing up in this country. It is based on exactly what you are saying. It's based on just the wonder of this land and place. I was saying to some of you before, I will take people to places like this, and they don't get it. I'm sorry; there is not anything I can do about that. If this isn't logical, then you are not with me, and I can't bring you with me. Because you have to look at all of this and think that the trees and the ancient castle and the island and the loch are under the blue sky that is the blue of my bonnet, that is the blue of the Scottish flag-that is what Scotland is about. It is about the colors. It is about the feel of the air, as you said; that is important. Iain continues: Look at the hills over there, the breasts of the Mother Goddess. The people in Scotland didn't need to have a great deal of detail. They accepted that they were in a sacred setting, and they were. There wasn't a distinction between the sacred and the profane. The sacred was just there-the way that it is just here now. Iain continues: If you forgive me for interjecting, I think you are absolutely right about the women. It is my suspicion . . . again this is not history; it is not fact . . . but Saint Serf (or Serb) Island and the Culloden Church are the inheritors of the Druid tradition. I suspect this one here was the island of the women. At Saint Serf Island, where there is also a priory, there would be Druids and there would be the pagan nuns. This island would be perfect for the women, because of the feel of the place. It is such a sacred site, and you have the larger island for the Druids, for the men. There would always be fewer women because women were less free to make their own choices and become religious. So there were fewer women, but they would be on this island. And I would suspect, as you say, away from the gaze of life, they were communing in nature on behalf of the community, but without the judgments of the community. I am only saying this not to interject but to confirm. Group member Roar: Yes, we could actually hear the women singing when we got closer to the island. Aluna continues: There is a definite rejuvenating quality that they gained by being on this island, because what was anchored here a long, long, long time ago is full of light. I can see that this energy was anchored in ages past . . . through many shifts of ages. The women knew that they could come here re-anchor, recharge, and remember. Words are hard to find. This energy is just a state of being in a state of nature with a safety net in which to allow a state of total openness. One of the things Lightworkers did throughout the ages (Lightworkers who kept the Earth from going into total darkness) was to maintain the ability to stay open, even in the darkest of time. It is hard work. Many times in history, it got very, very difficult to hold this light. Groups splintered off in different directions out of protection for the wisdom. Therefore, over time different traditions developed separately and did different things in order to anchor the light. The women would return to this place, and it would help them maintain their openness when everything else was kind of going "wacko." This place balances in an extremely gentle, very nurturing way. I don't feel any ending or tragedy, nor do I feel that something is ongoing and will continue to go on. It doesn't feel like whatever was started here had a beginning, and I don't think it had an end as well. This land feels eternal. The Ancient Ones that were sensitive enough to pick up on this energy knew this, and that's why they left relics to point us here. If there weren't a stone building or a remnant of something, we probably wouldn't come. There are little islands everywhere. Our local Scottish guide Iain: They named the landscape and even the manmade things . . . for instance . . . the Lomond Hills are the breasts of the Mother Goddess. There was a stone in the lowland tradition, the witch of Halloween. But she is not the witch: she is the triple goddess in her crone stage. The witch is known as the cailleach (ancestral deity or deified ancestor) in Gaelic and in Scots. Because the landscapes have been named, the whole ideas surrounding Loch Leven and the Lomond Hills have stayed with us. They have not been eradicated because they have been named. Our local Scottish guide Iain continues: You were talking about people judging people. The magic (not magic like Harry Potter, not with fire coming out of a wand) in Scotland or other places was largely from the power of suggestion. If you name something, you give it a power or energy because other people can interact with that it. Even if it doesn't actually have an energy, the fact that it has been named means other people's energy of thought interacts with it. So, that is the reason why the names of all the places are important to me. That's how a huge, huge amount of my understanding arose, since this stuff isn't taught to us. But because they call the hills the "Paps of Fife," I know what they are, and I can confirm it. I have a mental handhold for other information that is attracted to that name. So that legacy of naming the landscape, like leaving the pointers that you were talking about, has pointed my way to my understanding. Group member Kerrie: Tying into what you both are saying. I just had the visualization of the Flower of Life on the Earth here. And from my travel and my understanding, through my own interpretation, energy was everywhere that the ascetics went. So the energy was there first, and then we travel to those energy places to become enlightened. So there was energy first; then there were people, and then there was enlightenment. Our local Scottish guide Iain: I think so. That's why all of these different ethnic groups were in Scotland . . . because they were drawn there. Group member Roar: For me it is a place of huge heart opening. Aluna: Yes, a heart opening like the past life overlay I was feeling in Tintagel. It was safe to let your heart open here, because nobody was projecting on them here. Isn't that the way we always are when we are waking up? When we first start waking up, we kind of hide in the closest a while. We don't let anybody see who we really are because we are afraid we will be judged. We instinctively know to avoid judgment, as it can alter our growth by draining our energy. When we get strong enough we come out. And for a while we think we are the only one feeling these feelings, or knowing what we know. Then, when we have the courage to start sharing, we discover there are thousands upon thousands of people all across the Earth that are opening their hearts and waking up to their authentic selves. This is not the faux self that we have been programmed to live, but our true authentic self. Our local Scottish guide Iain: That is why Lao Tzu of the Tao says, "When there are no taboos, then there will be truth." Our group sang a blessing song to the land and the Goddesses. Aluna: The Rose Line is an acupuncture point. It feels like this sacred pattern under our feet began to rise up when we were singing. Singing from our hearts brought the energy up to us, and we gave some back. There is an energy exchange happening between the ancient women who sang here and us, so we are reenergizing the place by being here. But we are definitely receiving something to take along home with us. (and those reading this as well). When we were singing the song about we are so blessed, I knew that the women who were supposedly imprisoned here felt that they were so blessed as well, because they didn't have to deal with the crazy world out there. It was somewhat like a "ha ha to you . . . We are imprisoned here and well taken care of, and you have no idea what you have done for us. We get to be on this perfectly clear, psychically protected island. Everybody has forgotten that we are here, and we can be who we are-the very thing you were trying to stop." So they were in the world but not of it. Light always wins. The blessing was incredible here. So the Star Elders are asking us if we are brave enough to invite more of this wide open heart into us now. I think this is why we named the trip what we did: we call it "The Path of the Illuminated Chalice Within." The chalice is our heart. It is time to illuminate and awaken and open that heart-chalice even further in this spot. The Star Elders are offering this opportunity to us (and to those reading this). So as we wander and touch trees and stones, ask that your heart be opened further and wider. This is what the Star Elders drew us here for. They want us to ask for this next step of heart opening. We must ask for it, or they will not offer it to us. Once we ask for it, this heart-opening will continue for the rest of the year until we reach the level our souls agreed to. Each day we should ask to take a couple of steps further than we are accustomed to doing. We are ready for a huge breakthrough. Oh no! Archangel Michael is jumping in here. . . . He is humming The Doors' " Break On Through (to The Other Side)." He has a really, really crazy sense of humor. So that is what we are doing. We are going to bust through to the other side with the power and grace of our hearts. Barbara: I was thinking, Iain, about what you were telling us about the weather forecast in Scotland . . . it's either raining or about to rain. Well they have certainly changed the weather forecast on this island. Our local Scottish guide Iain: Yes, yes. We sang the Sunshine Song on the bus, and remember what I said before about hoping . . . if I catch anybody not hoping for sun . . . because that is what it is about. It's about breaking through. There is a perception in traditions in Scotland that we drift. Maybe there is an ultimate breaking through, but we shimmer, like toggling between the two existences. We are not taken to only the mundane and the profane, because we are more than one person . . . because we are different strands of neurological processes and other things, we can shift into different appreciations. Places like these help us focus that. And that's also true in the festivals in Scotland. That's true in the traditions and the songs, and that's what all these things are for. We are holding hands here, and you will know the Scottish tradition because when we sing "Auld Lang Syne," people hold hands like that. People do these ritualistic things naturally in society as the separation between the sacred and profane is lessened: there is much more blood in Scotland. It's a kind of shimmering between realms. PS. It would have been so much fun if you could have heard Iain's accent. He was charming and understood us tribe of weirdos. We had overwhelming blessings everywhere we went on this journey to Avalon. When our group went back home, we were all shocked at how deeply this pilgrimage had shifted us. Even now (four months later) as I post this last message, when we speak to each other, we still don't know what to say about it. We went on to Roslyn Chapel after this Loch Leven Castle day with our hearts wide open and ready to download its mysteries. What transpired in Roslyn was truly beyond words and too precious to share at this time. We would not know what to say anyway. It was powerfully deep, and we received on a level we have never felt before. The only way we can share this with you is by the sacred site essence we made in Roslyn. We have shared the Avalon messages here from our hearts for you to read. We hope that the messages have transmitted at least a small part of the energy we felt there. If you want to go deeper, please read them again in order with your heart open, and remember to ask for it. : ) We are called to go back to Avalon in 2013. We are certainly not done there. We want to thank the guardians and spirits that worked with us each day, and thank you for leaving the door open for us to return.